It was twenty-one years ago, in 1991, while conducting the socieconomic and cultural heritage components of an Environmen Impact Assessment of a hydro-electric project proposed Northern Shewa, Ethiopia, that I first became interested in the monastery of Debre Libanos. Encouraged by Professor Richard Pankhurst and the late Degife Gabre Tsadik (then Chief Librarian of the Institute of Ethiopian Studies, Addis Ababa University), embarked upon a study of the history of the monastery, of which the present publication constitutes a part. 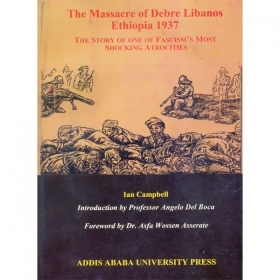 In contrast with this 16th -century onslaught, in which one the Imam's military commanders went to some trouble to attempt negotiated settlement with the clergy, the more recent massacre and pillage of Debre Libanos by the forces of Fascist Italy in 1937 was more cold-blooded in its execution, and more devastating in terms of the extent of the slaughter. Yet the outrage is little known, and when Degife and I attempted to find out exactly what had happened, we discovered that none of the written sources - neither Ethiopian nor foreign - provided any details .. Most writers had the relied on a bald two-line reference in telegrammes dispatched to Rome by Viceroy Rodolfo Graziani. Thus it became clear that the facts had never been published - let alone .anyone ever being held to account. Degife and I thus decided to attempt our own investigation of the massacre. However, had we realised at the time what we were letting ourselves in for, we might well have never embarked on the project, for the investigations were to prove long and complex.